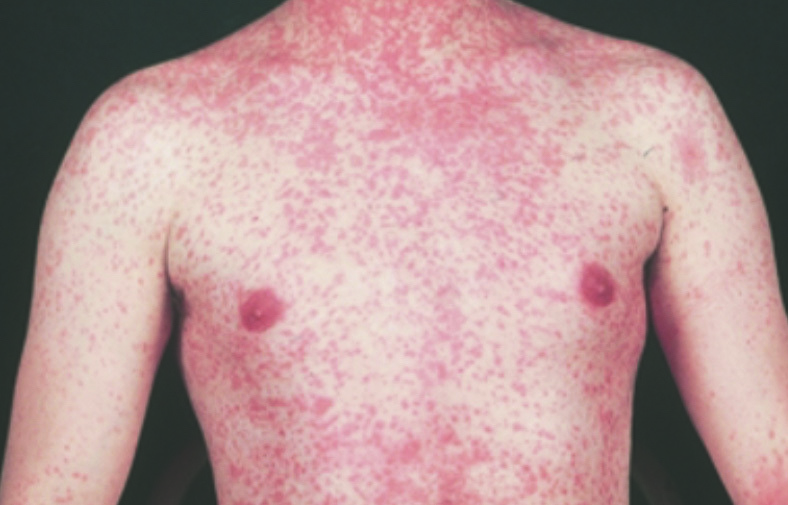 If you look like this, you probably have measles. Two cases have been reported in Champaign-Urbana since the beginning of the year. Both cases were in unvaccinated college students. Across the country there are currently 101 cases, according to the Centers for Disease Control. Two cases have been reported in Champaign-Urbana in recent months — the first in January and the second in early February. Both cases were in unvaccinated college students. Across the country there are currently 101 cases, according to the Centers for Disease Control (CDC). Washington state, home to a group of anti-vaccine activists, is having the most trouble. There are now so many cases the governor has declared a state of emergency. 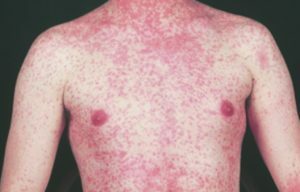 According to the CDC, measles is highly contagious and communicable a full four days before the characteristic rash appears. It’s spread by respiratory droplets which can remain in the environment and infect others for two hours after the host has left. First, a patient has flu-like symptoms, then a red flat rash, starting on the face and neck. The rash then begins to appear more solid and spreads to the trunk and arms in two to three days where the spots remain discrete. Some parents have chosen to skip the routine MMR vaccine — measles, mumps and rubella — which most people get as children. 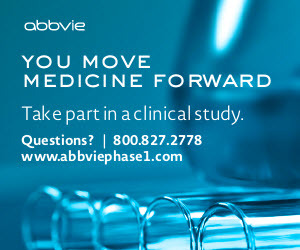 The trend started after a study was published in a medical journal in the 1990s linking MMR to autism. However, that study repeatedly has been proven to be incorrect. The World Health Organization placed the reluctance or refusal to vaccinate as one of the top 10 global health threats in 2019. University of Illinois Extension’s Community and Economic Development team will host a free webinar entitled Think Global, Eat Local, at 12 p.m. Feb. 21. This webinar will highlight Illinois Extension programming designed to assist community leaders and others in addressing the need to making food more accessible in their communities. Participants will have the opportunity to learn how communities can partner with Illinois Extension to improve the lives of their citizens through local food projects, such as community gardens, mobile markets, food banks and more. The presenters will discuss food insecurity, planning a community food project, sustainability through fundraising, as well as how to promote volunteer and youth involvement. Participants also will learn about ways to provide their communities with healthier food options and a higher quality of life while encouraging community engagement and environmental sustainability. There is no cost to attend the webinar, however registration is required at go.illinois.edu/LGE. Contact Nancy Ouedraogo at esarey@illinois.edu for more information. St. Joseph Catholic Church of Pekin will host a Spring Festival Breakfast 7:30-11:30 a.m. Feb. 24, in the cafeteria of St. Joseph School, 300 S. Sixth St.
Tickets will be sold at the door for $6 for adults and $3 for children. Sausage and egg casserole, biscuits, fruit cups, milk, juice and coffee are on the menu. Assorted doughnuts will be available for $1. Door prizes will be awarded. Information about the upcoming St. Joseph Festival will be announced. This event is sponsored by the St. Joseph School Parents Club and Mary Ann Ladendorf. For more information, call the church at 309-347-6108. The Pekin community has until March 2 to convince Kraft Foods that it should give the community up $150,000 to upgrade and improve the Pekin Memorial Arena. As part of the contest, the community is asked to go to the kraft hockeyville website, krafthockeyville.com, and post about why they need the funds. At the website, voters should follow the onscreen instructions to find the community page for Pekin. Once there, follow the onscreen instructions to register (on first visit only). By entering this contest, Kraft Heinz Foods Company and its portfolio of brands may send you information and offers. Then, follow the links and instructions to add content or share, as outlined on the site. Voters are asked to add photos and tell their story about what the rink means to them. Enjoy an entertaining night full of laughs benefiting the Kiwanis Club of Pekin at the club’s third annual Stand Up for Kiwanis. Doors will open at 6 p.m. Feb. 23, and the show will start at 7 p.m. Tickets are $15 in advance and $20 at the door. There will be a cash bar. The show is for people 21 years of age and older. Comedians can still register to perform. Local rookies and those with experience are asked to call 309-241-7700 or send an email to bayleegambetti@gmail.com if interested in performing or would like to suggest a performer. The performer who receives the most “penny votes” will win. Pekin Area Chamber of Commerce, 402 Court St., Pekin; and online at StandUpForKiwanis at eventbrite.com. All proceeds will benefit the work and projects of the Kiwanis Club of Pekin.